After his award-winning book on Fred Trueman, Chris Waters has given us another excellent book on another famous Yorkshire cricketer a little before Trueman's time. Hedley Verity, a very different cricketer and person, is perhaps most well-known for helping England to their only Lord's victory against Australia in the 20th century and, the subject of this book, cricket's greatest statistical bowling performance. This book, like Grahame Lloyd's Six of the Best, concentrates on one outstanding performance. Lloyd's book took Garry Sobers's feat of becoming the first cricketer to hit six sixes in an over whilst Verity's performance, although far from being the first occasion of a bowler taking all ten wickets in a first-class innings, still remains cricket's best eighty-two years later. Part of its appeal is the nice ring to it: ten wickets for ten runs. Both books involved Nottinghamshire. It is a most entertaining and enjoyable book. Setting the scene before the famous match, Herbert Sutcliffe had just reached his hundredth first-class hundred in Yorkshire's previous match only to fall for a golden duck in the first innings of the match the book concentrates upon. This match is described in great detail and, what had initially become a struggle for eventual champions, Yorkshire, after conceding a healthy first innings lead became, after Verity's immortal performance, a ten-wicket victory. Verity's remarkable second-innings figures of 19.4-16-10-10 are figures which dreams are made of. Spare a thought for the chap at the other end, George Macauley, who went wicketless as much because he spun the ball too much whilst Verity spun it just enough to take the spoils. And what spoils. Verity's performance included a hat-trick as Nottinghamshire, at 63 for 3, went from a comparatively comfortable 63 for 3 to 67 all out and put Verity into cricketing folklore. In the days when cricketers played rather than being rested, many of the legends of the day took part in this match including, for the victors, Herbert Sutcliffe, Percy Holmes and Bill Bowes and, for the vanquished, the outstanding pace bowlers, Harold Larwood and Bill Voce. Chris Waters describes in wonderful detail some of the amusing anecdotes of off-the-field events including, amongst many others, Nottinghamshire captain, Arthur Carr, and his driving abilities. "..., he was driving two team-mates at breakneck speed when one fell out having fallen asleep, with neither Carr nor the other man noticing. A policeman appeared and, by way of a sobriety test, asked him to say: "Sister Susie's sewing shirts for soldiers." Carr protested: "Damn it, I can't say that when I'm stone cold sober." The policeman let him go." Waters's descriptive powers also include the fine Yorkshire and England player, Bill Bowes, thus: " Bowes, 23, was the side's youngest member and its most identifiable because he didn't conform to the stereotype of a cricketer; blond and bespectacled, with studious mien, he looked as if he'd escaped from a science lecture and that his presence on the field was a scientific experiment. " Fine bowler that he was, his batting and fielding were not in the same class as Waters later tell us that it was someone else's duty to chase the ball to save Bowes's legs and probably his blushes and that he was only expected to stop or catch the ball if it came straight to him. If he lingered too long with the bat, it was his partner's duty to run him out. Although very few photos of the match exist, the book is still nicely illustrated with other cricketing photos and naturally a scorecard of the match can be found towards the end of the book. 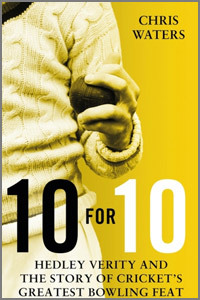 It is nice to read of what happened to all the players after the match in a later chapter entitled The 10 for 10 Cast. Sadly, Hedley Verity became a victim of World War Two. As war was about to break out, he had told his father that that would be the end of his cricket career and, in 1943, after being badly injured in Italy, he died eleven harrowing days later at the age of just 38. His memory lives on in many forms, most recently in a Leeds pub bearing his name. Once again, Chris Waters has written an excellent book and, with Wisden's superb production, this is a wonderful book at a bargain price.